NOTICE: Do not upgrade to system menu 4.3! It will kill your mod and remove the homebrew channel, dvdx, and a few other things. Bannerbomb doesn't work on this system menu yet. DO NOT UPGRADE. We have an official xBox hacking thread so I figured we needed a Wii hacking thread. So here it is. If you have any guides you have posted on other websites could you please repost them here in a reply and I will add a link to it from this first post. Until then I will be using a lot of information from the WiiBrew Wiki. If anyone has problems with the font color I have chosen try using a different theme. If it still bugs you or you can't read it let me know and I'll change the color to something different. A Gamecube controller (Preloader or BootMii won't work with the normal WiiMote) You can use the buttons on the console itself but the Gamecube controller is easier... More on this later. Organized_Chaos nor anyone else on PSP-Hacks.com can be held responsible if you brick your Wii using these tutorials. Read everything twice and make sure you understand it before you attempt it. On that same note, if you get a lawsuit thrown at you or end up in jail because you pirated video games we can not be held responsible. If your Wii has system software 3.4 or lower installed on it you can hack your Wii using the Twilight Hack, if it has 4.0 or higher you will need to use Bannerbomb. The Twilight Hack was the first way to enable homebrew on a Wii without hardware modification. The Twilight Hack was used by playing a hacked game save for The Legend of Zelda: Twilight Princess which executes a homebrew application from an SD card. Examples of such homebrew .elf or .dol files can be found on the Homebrew applications page. The Twilight Hack was created by Team Twiizers. Twilight Hack 0.1beta1 is compatible with System Menu up to 3.3, 0.1beta2 is compatible with System Menu 3.4. The twilight hack is not and never will be compatible with System Menu 4.0 and up. SD card (<= 2GB, not SDHC) formatted as FAT16 or FAT32. (The Wii System Menu, which is used to copy the save, only reads SD cards, not SDHC). Inside the zip file you will find versions of the hack for all three regions. You may copy all of them to your SD card, but you will need to choose the correct one to copy to your Wii based on your version of Zelda: Twilight Princess. USA users, additionally, need to determine the correct save slot to load once inside Twilight Princess. The easiest way to check your version is to compare the text string which is on the inner circle of the data surface with the ones below. Ensure your SD card is formatted as FAT. By default SD cards are formatted as FAT, so if you're not sure you can skip this step. Put your SD card in your computer, and copy the "private" folder from the card to a safe place. Copy the "private" directory from the Twilight Hack download to the root of your SD card. Take your homebrew Wii executable (elf or dol file) and save it in the root directory of your SD card as "boot.elf" or "boot.dol" as appropriate. Go into Wii Options --> Data Management --> Save Data --> Wii. Find your Zelda save, click on it, click "Erase", and click Yes. Open the SD card and select the "Twilight Hack" save that corresponds to your game region. Note: Some people are having problems with the Wii not "seeing" the save file on the SD card. If you are experiencing this, try setting the archive bit for the data.bin file - in Windows this can be either be done from the file's properties dialog (right click on it in Windows Explorer and check the box) or from the command line using "attrib +a <path to data.bin>". More info at #wiihelp on Efnet. Click copy and then yes. Now exit out of the menu. If you are using System Menu 3.4, you must immediately put the Twilight Hack to use. Turning off or running some other channel or game will have the System Menu delete the savegame again, and you'll have to start over. Insert The Legend of Zelda: Twilight Princess game disc and run the game. * If you have the USA version of the game, load the "TwilightHack0" or "TwilightHack2" version of the game as appropriate (see above). * Otherwise, load the only "Twilight Hack" save game. Once in the game, either walk backwards or talk to the man standing in front of you. Last edited by Organized_Chaos; 05-05-2010 at 09:04 PM. Bannerbomb is an exploit capable of launching homebrew from any version of the System Menu. It was created by Comex to replace the Twilight Hack, which does not work on System Menu 4.0. NOTE: Whilst the original version of Bannerbomb (the version which launches via Data Management) does not support System Menu 4.2, the updated version (launches via the SD Card Menu) does! The original Bannerbomb exploit does not work with System Menu 4.2, it only works with System Menu 4.1 or older. However Bannerbomb v2 has been released by Comex, and works on 4.2. Bannerbomb v1 , for System Menu 4.1 and below. Last edited by Organized_Chaos; 05-05-2010 at 08:35 PM. Apps can be used for a number of things. There are two main ways to get an app on your Wii after you have the homebrew channel: You can use the Homebrew Browser to download it using the Wii's wifi, or you can download it on your computer and put it on your Wii's SD Memory card. If you chose to place it on your memory card manual instead of using the homebrew browser then you will need to place the apps inside of the apps folder (if it doesn't exist, create it). The homebrew app will normally contain a boot.dol file, icon.png, and meta.xml. These files should be inside another folder which will then be placed inside the apps folder on the memory card. You would then put the memory card in the Wii and launch the homebrew channel. You should be able to see the app(s) there if you followed the directions correctly. You can find a full list of homebrew apps here. We need an official PS3 Hacking Thread. -Good job. Keep it updated. If you are anything like me you are probably curious to know how to watch movies or videos using your Wii. To do this you need to have DVDX and MPlayer CEDVDX is a hidden channel that allows Wii Homebrew Programmers to let their programs read DVDs that are not Wii games. 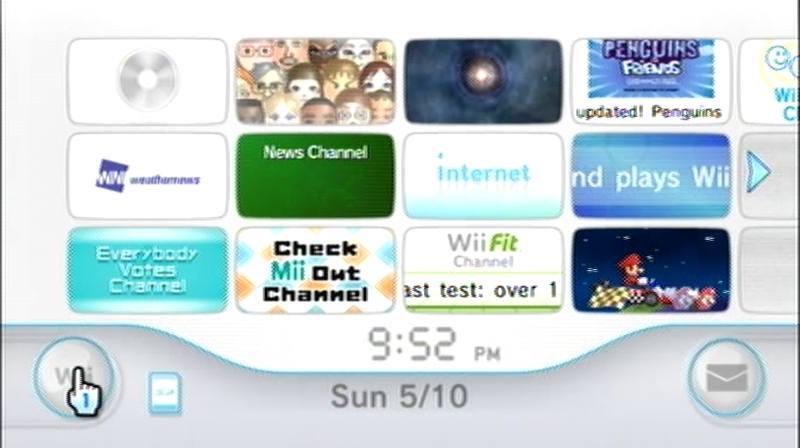 You will not see DVDX in your Homebrew Channel on your Wii System Menu as a channel. If you used Bannerbomb to hack your Wii with the HackMii installer then you probably already have DVDX and you just need to install MPlayer CE. If you hacked your Wii using a save game exploit to install the Homebrew Channel but you haven't installed HackMii then you can use this if you have the 3.2 or 3.3 System Menu and this if you have 3.4 System Menu. Check the Readme files for help on installing these apps. Once I get some time I will go into more detail on how to install these. Q : What type of DVD should I use? A : Pressed DVD-ROM video discs of course work. 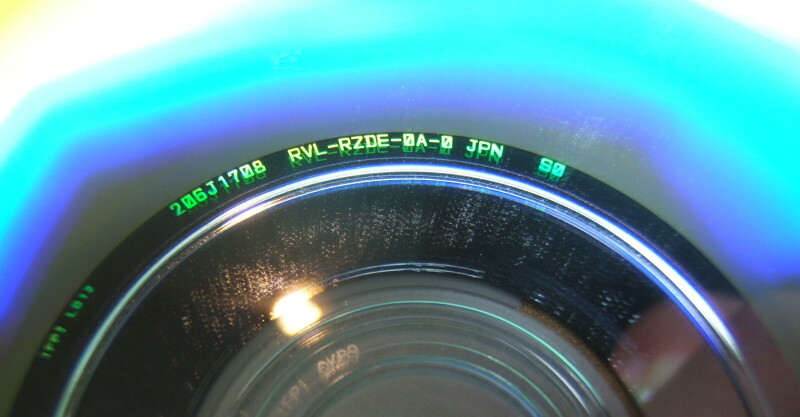 For recordables, DVD-R media is recommended, as they are the most similar to pressed DVDs in terms of reflectivity. However, DVDX has been confirmed working with various DVD media, including DVD+R/RW and DVD-R/RW discs. Verbatim is generally the preferred brand of DVD to use with the Wii. Particular brands (lower quality discs) may be problematic, and different Wii drives have different levels of compatibility. Please note that DVD+R/RW discs will need to have their BookType set to DVD-ROM to work properly in Normal mode (if you have no modchip). PatchMii mode does not have this requirement, but requires a modchip. Q : Why does my Wii not read my DVDs? A : Be sure that you install the latest DVDX, and that the application that you are trying to use supports the latest DVDX, with the new title ID (DISC). If you are using a burned disc, make sure it is burned correctly. Try re-burning the DVD on a DVD-R if it is not already. If you are using Snes9x GX, FCE Ultra GX, or Visual Boy Advance GX, you will need to install IOS 202 to use DVD, as they do not have DVDX support. Last edited by Organized_Chaos; 09-20-2010 at 12:07 AM. To brick a Wii is to damage the console beyond repair - as in 'A bricked Wii has all the electronic functionality of a brick'. 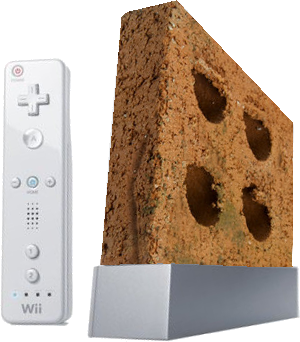 To put it simply, fully bricked Wii consoles do absolutely nothing. The term is often used in situations where modifying a system's firmware (without necessarily making any alterations to the machine's hardware) has caused it to become inoperable. A “full-brick" Wii displays an Opera error message instead of the “warning” screen when the Wii boots — it does not even check the disc drive for a disc before displaying this, meaning it is impossible to fix this using software unless you use a Savemii with an autoboot disc. Full bricks due to other causes can simply cause black screens on boot. Some are recoverable with a SaveMii and an autoboot disc, and others aren't. A semi-bricked Wii has a small error in the System Menu. Once a Wii is semi-bricked, it cannot enter the settings screen. There are repair discs for semi-bricked Wii consoles, but not for those fully bricked. The so called Error 003 occurs when a Korean Wii gets region switched to a different region and then updated to 4.2 via the online update. There is currently no way known to fix this error. Only install updates for your own region. DO NOT delete critical system files. DO NOT install modified versions of system files, unless you have a very good reason to do so. DO NOT install unofficial channels unless they come from a trusted source and really serve a useful function. Malformed channels (especially the banner part) can make your System Menu crash on boot. Loading applications from SD is much safer. Ensure that you know what you are doing when installing/running homebrew applications, especially those with the "Homebrew Dangerous if Misused" banner on their page. Be VERY careful with applications such as AnyRegion Changer, Starfall, downgraders and any other applications which obviously mess about with the system files. Don't touch your Wii's power or power button while doing any updating or installation of system content. Definitely don't do those during an electrical storm. If a Wii becomes bricked, there may be a way to unbrick it. This requires a modchip and/or Starfall installed, as even with the Savemii dongle, the recovery mode normally only boots Nintendo repair discs. With Starfall the disc check can be bypassed; with a modchip this allows you to boot recovery software from a disc. This method is outdated and has a lot of requirements: The Wii needs a at least semi working system menu and a fully working system menu IOS. Also (illegal!) copies of the old repair disc won't work on updated systems, because IOS16 was stubbed and homebrew discs require the trucha bug inside the correct IOS or that IOS has to ignore signing completely. If you do have a copy of the Indiana Pwns save already in the Wii, and an authentic LEGO Indiana Jones disc, you can use this to boot recovery software as well. This also requires a at least semi working system menu, a fully working system menu IOS and some way to still boot game discs. There's a method to get the Indiana Pwns savegame on the Wii nand after a brick: Spam the nand with savegames until it's nearly full, try to install the rabbids go home channel(maybe others work as well), get the option to go to data management and copy the savegame over. Note: Starfall is outdated, preloader is able to do everything Starfall is able to do and more. With Starfall installed, hold Y to boot a disc in recovery mode. This method obviously requires Preloader to be installed, and configured to boot something other than the System Menu. Simply boot a recovery program the way you would any other. if you have preloader installed, but it boots to the SystemMenu then try holding down reset when you turn on your Wii, after a few seconds of holding reset the preloader menu should appear. This method requires a NAND backup BEFORE the Wii bricks, so it's advised to backup your NAND right after you install BootMii. If you installed it as boot2, then simply go to the second options screen and choose the second icon which can recover from the brick. If you installed it as part of an IOS, then you will need Preloader installed. Go to the HBC via Preloader, then select "Launch BootMii" from the main menu. This method requires soldering many wires to the Wii's motherboard in order to use a NAND programmer/Infectus to rewrite the flash directly. You will need to know your Wii's NAND keys. This option is the least desirable for homebrew users, as Nintendo will likely send back a different console, with your personal settings/VC account transferred and the latest updates installed. Each region has its own version of the System Menu (1-2). For example, 3.2 of the System Menu available is v. 288 (NTSC/J), v.289 (NTSC/U), v.290 (PAL). The only difference between those three versions is two different files — the main executable for the menu (a .DOL file, more or less) and an ARC archive that stores compressed versions of the HTML / image resources. The code’s pretty hard to tease apart, but they seem to be trying to determine the system region from the setting.txt file, and then building up a pathname to load like so: sprintf(filename, “html/%s2/iplsetting.ash/%s/%s/ENG/Setup/ScreenSave.html”, region, region, region). This is so silly, because if they had hard-coded the path then the system would have booted just fine. A full brick is caused when SYSCONF is missing, damaged, or has the "reconfiguration" flag set. This usually occurs after certain updates. The Wii would usually show the settings screen on boot to let you adjust some settings, but since it is broken, you end up with an un-bootable Wii. A banner brick is caused when a channel with a malformed banner (icon), is installed. Due to the poor error checking of the System Menu, the system menu cant handle the corrupted banner, so it crashes and thinks that it is a file corruption. This is a generic error encountered by a Wii caused mostly because of a dirty or damaged disc inside the Wii Console! The best thing to do is check the disc for any scratchs or dirt that could cause disc read errors. You have tried to access the address (), which is currently unavailable. The Opera error message is caused by a corrupt settings menu, or installing a System Menu Update from a disc from another region. This is called a Semi-Brick. Please share your knowledge and add more information to this page. Thanks! I know none of this is my original work but the fact that it is all in this one location with plenty of active members to help answer questions makes this useful.